LMGTFY is an abbreviation for Let Me Google That For You. A few years back some cool guys launched a service called lmgtfy.com with a thought. The idea is simple but fun. If someone asks you a question and you want to answer in a fun way but also letting them know that they should have just Google it themselves. 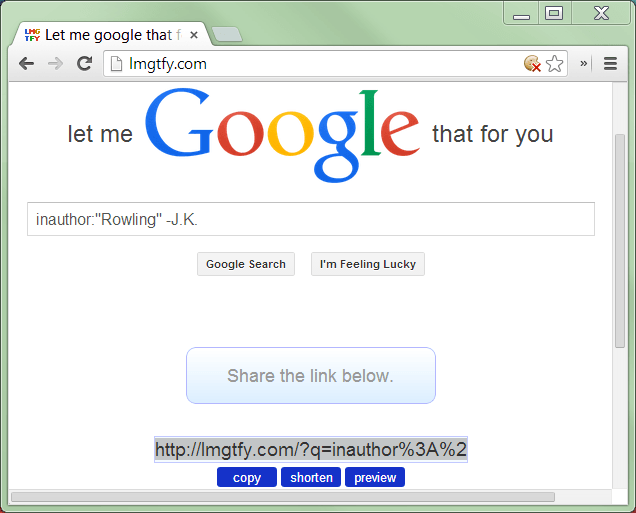 Head over to lmgtfy.com and type your search query and click on Google Search or I’m Feeling Lucky button. Instead of the results page you get a link with an option to copy, shorten or preview it. The preview will show you what exactly the people with whom you will share the link will see. It plays a short demo showing the query text typed into the search box automatically and button you chose to press during link creation is pressed. Next you are taken to actual Google search result page. Along with a basic Google search the service also supports other vertical searches like Image, Video, Maps and many more. They also launched support for Wikipedia last year. Since its launch, then, many people started using it for this very purpose. You find lmgtfy links on many discussion threads. Apart from this, I believe this awesome service can be used for educational purpose as well. The web is filled with many hacks about how to use Google search efficiently. However, most people still use it in its basic and simplest form, i.e. to type questions or keywords into the search box. Below are examples of my top 5 favorite Google search tips explained using lmgtfy. You want to search for all books authored by Rowlings other than J.K. Rowling. – inauthor:”Rowling” -J.K.
Let me know what would you do with this service?